Last week we looked at how to end a standalone novel so as to satisfy the reader. This week we'll look at how to wrap up books that are part of a series. Tie up any loose ends by answering lingering questions about the plot. Re-orient the characters towards the next phase of their lives. Once you've done those two jobs, you stop. Particularly after finishing the second one. In brief, that's how you end a novel. But what do you do in a series? It's easy to do those two jobs when you're done with these characters and don't expect to write any sequels. But how do you provide the sense of satisfaction a proper denouement brings when you still have sequels left to write? Hook the reader with what's coming next. In the same way that your scenes and chapters ought to build up anticipation for the next scene and the next chapter, so too each installment in a series must build up our anticipation for the next installment. That said, the way you treat all three jobs is a little different for series books than standalones. In a standalone novel, right after the climax we usually get several pages of wrap-up material that tie everything in a nice neat bow before the end. For a series novel, you mix some hooks in with it. Somewhere in those pages you do that third job by giving us some hints, foreshadowing, or even blatant statements about what's to come. That might take the form of raising some important question during the course of the story, then leaving it intentionally unanswered. If you go this route, I encourage your characters to spend some time talking or thinking about this question so as to bring it back into reader's minds just as the story is ending. The hook might also take the form of raising new last-minute questions, one you clearly don't have time to answer. Be careful with this strategy, though. Unless handled deftly, readers can spot those questions as obvious sequel-fodder. We may bristle at being manipulated in that way. You also run the risk that the new question isn't sufficiently compelling. With a loose-end hook, we've had time over the course of the novel to become invested in that question. We're more likely to care enough about the answer to bother buying and reading the next book. With a last-minute question, it's a lot easier to just shrug and be content with having learned the answers to this installment's mysteries. In a standalone novel, reorienting means giving an indication of what the characters are going to do with their lives now that the adventure is over. In a series, you achieve that same thing by giving indications as to what the character will be doing between now and chapter 1 of the next book. Typically, your next book picks up after some amount of time has elapsed for the characters, so all we need is a sense of how to bridge that gap. A story-arc series is one in which several books join forces to tell one collective story. This type is enormously popular these days, so I'm sure you can think of plenty of examples. An episodic series is one in which the main characters live through a series of unconnected plots, which are only related to each other through those characters, the genre, and the general nature of the stories. Mystery series, such as Alan Bradley's delightful Flavia DeLuce novels, are prime examples. Story-arc series follow the guidelines I've outlined: tie up loose ends for the current book's plot, hook us with something about the next installment, and re-orient. Because episodic series lack an overall story-arc which relates their individual book plots, you're kind of out of luck for doing job number 3. How can you hook us about what comes next, when you may not even know yet? Or when, to be honest, it doesn't even matter because the coming story has no particular relationship to the one we just finished reading? You do it by introducing something else that can carry forward from one book to the next. Typically, that's some kind of character arc or other business in the protagonist's personal life. The Flavia DeLuce novels are episodic murder mysteries. However, running throughout the series is another mystery about what happened to the main character's mother, who has been missing (and presumed dead) since Flavia herself was an infant. Each book successively builds on that element, until readers understand it as the central mystery of Flavia's own life. One she's desperate to solve. As readers become increasingly invested in that uber-mystery, we look forward to each new book because we know we'll discover more clues about it. Bradley sprinkles these clues throughout the stories, but frequently revisits them during the denouement. In one case he springs a particularly large development right at the very end, leaving neither readers nor the characters any time to process it. Very much like a cliffhanger ending. Speaking of, we should talk about cliffhangers briefly because they play by different rules altogether. A cliffhanger is when you end a story abruptly at a point of high tension. Right at the point where the reader is desperate to know what happens next, you end the book. Ending a book this way is tantamount to abandoning jobs 1 and 2 entirely. There's no wrap-up of any loose ends. All the ends remain intentionally loose. There's no re-orientation of the characters towards the next phase of their lives, because they're still stuck in the middle of this phase. A cliffhanger ending is pure hook. It's betting all your chips on job number 3. By ending in the middle of the action, we have a very good idea of what's going to be happening when the next book begins. A cliffhanger ending also implies that no substantial time will pass between this book at the next. There's no need to suggest how the characters will bridge that gap when there isn't going to be a gap. A cliffhanger ending is really a non-ending ending. It's really just a way of splitting a single plot across multiple books. And it only works if the moment of high tension you end on is in fact dramatic enough to sustain readers into a second volume. Cliffhangers aside, the form those three jobs takes may vary from book to book, but the overall pattern is always the same: Tie up loose ends, hook the reader, re-orient the characters, and stop. I emphasized the stopping last week, and I'm going to do it again now because it's just as important for a series as for a standalone. If you push a mid-series installment past the re-orientation, you encroach on the material you ought to be saving for your next book. And if you push past the re-orientation in the last book of a series, you prevent the characters from living on in the reader's minds as much as they might have done. The most notable example I can think of that most readers of this blog are probably familiar with is Harry Potter and the Deathly Hallows. Recall that after the big climax, there is a brief and proper denouement, but that's not the end of the book. The actual end is an epilogue scene showing the main characters many years later. Many people have criticized this ending for being anticlimactic and unnecessary, points I agree with. But I understand why J.K. Rowling did it. It's hard to say goodbye to characters you have grown so strongly attached to. I had that exact same experience on the first novel I wrote. I remember quite vividly writing the scene where I was re-orienting my main character, and literally bringing myself to tears while sitting at my keyboard. Not because the scene was sad, but because I was sad to say goodbye. I didn't want to say goodbye. So I wrote an epilogue. 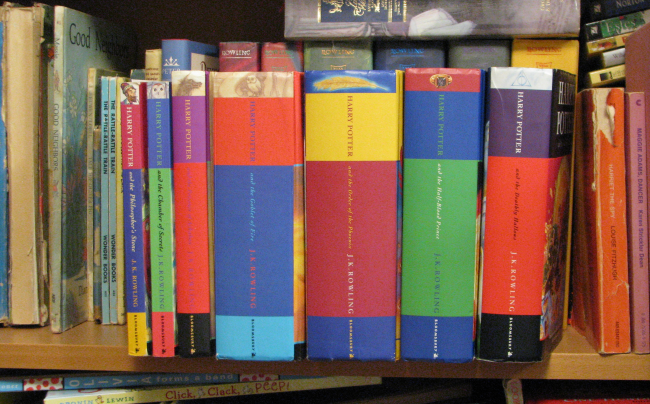 This was two years before Deathly Hallows was published, but I did exactly what J.K. Rowling did. I don't blame her. It hurts to say goodbye to characters who are literally part of yourself. Epilogues are writers' way of reassuring ourselves that the characters will live happily ever after, that it's ok for us to stop helicopter-parenting them. Epilogues give us the emotional closure we need so we can step away from the book. If you need to write an epilogue, go ahead. But that doesn't mean it needs to be in the book. Looking back, I understand now that my epilogue scene isn't there for the reader's benefit. It's there for mine. So someday when I get that book published, I'll take it out. I won't throw it away. Maybe I'll post it as an extra on my website somewhere. But it won't be there to sabotage an otherwise good ending and stop my characters from living on in readers' minds.